2014 has been a significant year for Radio Design India with ramp-ups in both Product and HWS businesses. 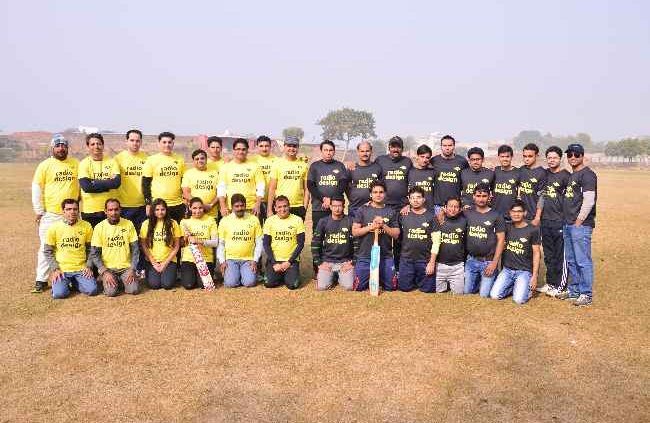 Employees have been very busy for the last few months and decided to celebrate the New Year with some competition and team building; with this being India, what better way could there be to celebrate the occasion than by organising a cricket match? Two teams were formed, Rangers [Product Business group] and Dynamites [Hardware Services Business group] with two captains, respectively Ravi Wadhwani and Asvin Rathi. 26th Dec 2014 was finalised as the match day and a suitable ground was booked. Customised T-shirts were ordered for both Rangers and Dynamites teams to give some colour and flavour to the occasion. Awards were available for the winning team, man-of-the-match, best batsman, best bowler and best fielder. On the day of the match the weather was quite British [chilly and foggy] but fortunately it turned into a normal sunny and pleasant day before the start of the game, itself. The match was of 25 overs and started at 10:30 am, with Rangers winning the toss and deciding to bat first. Their strategy was to score steadily and set a target somewhere around 150 runs for Dynamites to chase. Rangers’ openers set a good foundation but, suddenly, wickets started falling at regular intervals. However, Rangers remained calm and focused on their objective, scoring 135 runs for the loss of 8 wickets. After the lunch break it was Dynamites’ turn and, as their openers made a very solid start in their chase for 136 runs, the match began to look one sided. However, around the 20th over the match turned interesting as their wickets started tumbling, and they eventually fell short of the target, with a total of 120 runs in 23 overs. Rangers had eventually won the match but Dynamites certainly put up a very tough fight. Ashwani Bhat was man-of-the-match, Harish Bhargava was the best bowler, Madan Singh was the best fielder and Gaurav Chauhan was declared best batsman.